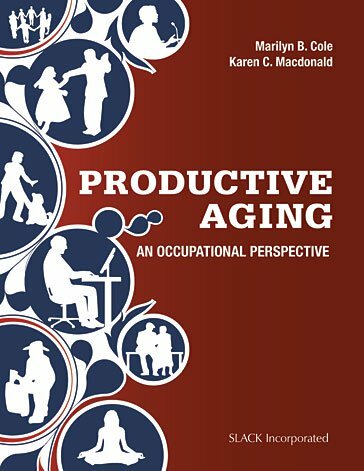 Productive Aging: An Occupational Perspective is a concise and practical text that takes a fresh look at our rapidly expanding and diverse older population. Recognizing the unique identity of each older person, this text provides client-centered guidelines for maximizing function, independence, and wellness. Productive Aging also outlines self-management strategies for promoting participation and engagement in productive occupations for the older persons’ own continuing development, health, and well-being. Productive Aging not only summarizes current evidence, but it looks into the lives of forty productive agers who shared their personal perspective with the authors as part of an original qualitative study. These participant stories, often told in the participants own words, describe how current theories of aging are applied in the lives of older adults who are currently living the experience. Older adults ages 60 to 98 describe the effective strategies they used to manage their own aging process, to structure healthy lifestyles and social connections, and to intentionally direct their own productive occupations in satisfying and meaningful ways. The results of this qualitative research study have led to a grounded theory of Conditional Independence, which guides occupational therapy approaches to productive aging in practice. Authors Marilyn B. Cole and Dr. Karen C. Macdonald explore the six productive occupations that researchers have identified as typical of older adults today: self-management, home management, volunteering, paid work, care giving, and lifelong learning. In addition to summarizing current research and theories within each occupation, concrete strategies and techniques relative to these roles are detailed, with multiple examples, case studies, and learning activities. Throughout Productive Aging, interviews with experienced practitioners, administrators, and educators reveal some of the implications of various trends and techniques. For occupational therapists, descriptions of settings and types of intervention are consistent with the latest version of AOTA’s Occupational Therapy Practice Framework, Third Edition. In addition to promoting productive occupations within traditional institutional and medical-based practice, occupational therapy roles include that of consultant, educator, and advocate when treating individuals, groups, and populations in home care, organizational, and community settings. Special attention is given to developing the ability to become an effective self-manager, facilitating social participation, and maximizing clients’ applied functional abilities. Productive Aging: An Occupational Perspective is the perfect addition to the bookshelf of occupational therapy students, faculty, and clinicians, as well as any health care practitioner who would like to update his or her knowledge of the aging individual within his or her current practice settings. Chapter 1 What Is Productive Aging? Marilyn B. Cole, MS, OTR/L, FAOTA began her occupational therapy career in mental health, creating programs for inpatient psychiatry at Eastern Pennsylvania Psychiatric Institute in Harrisburg, Pennsylvania and Middlesex Hospital in Middletown, CT, and mental health day treatment at Lawrence and Memorial Hospitals in New London, CT. Throughout her part-time and full-time teaching at Quinnipiac University, beginning in 1982, she continued to practice and also train students at the West Haven VA Hospital, and consulted at Fairfield Hills Hospital in Newtown, CT.
To expand her knowledge, she became certified in Sensory Integration, and for 3 years, practiced in pediatrics at the Newington Children’s Hospital and worked with children in surrounding public school systems. Her education includes a bachelor of arts in English from the University of Connecticut, a year of art education at Rhode Island School of Design, a graduate certificate in Occupational Therapy from the University of Pennsylvania, and a master’s in Clinical Psychology from the University of Bridgeport. Beginning in the 1990s, Marli consulted and also trained students at St. Joseph’s Manor, a long-term care facility in Trumbull, CT.
After retiring from full-time teaching at Quinnipiac for 25 years, and practicing OT in mental health, pediatrics, and geriatrics, Marli has written four textbooks: Applied Theories in OT: A Practical Approach (with Roseanna Tufano, 2008), Social Participation in Occupational Contexts (with Mary Donohue, 2010), Group Dynamics in OT, 4th Edition (2012), and the current one, Productive Aging: An Occupational Perspective. Throughout her professional career, Marli has regularly presented at local, national, and international conferences (Melbourne, London, Montreal, Stockholm, Sydney) and has supervised student experiences in England, Costa Rica, and Australia. She has completed research studies in sensory integration, mental health assessment, time management, therapeutic relationships, group size and cohesiveness, and with students, created training videos for Donohue’s Social Profile. She currently holds an interdisciplinary grant from Quinnipiac University with physical therapist Professor Russell Woodman, DPT, for which she educates patients with lower back pain with a self-management program entitled “Protecting Your Back.” Some of the photos from that program appear in the chapter on self-management. Marli and husband, Marty Schiraldi, enjoy sailing, cruising, and visiting with their five children and eight grandchildren. They are at home in Stratford, CT and Freeport, Bahamas. Karen C. Macdonald, PhD, OTR/L has specialized in geriatric occupational therapy for 35 years. Her undergraduate degree in occupational therapy was from Quinnipiac University. She received her master’s degree in Counseling the Aging from the University of Bridgeport. At New York University, she earned a PhD in occupational therapy. Roles in adult day care and long-term care as a clinician included program design and intervention for individuals and groups with acute and chronic conditions. Eventually specializing in dementia management, she was the Coordinator of the Special Care Unit at the Jewish Home for the Elderly in Fairfield, CT.
Over the years, she has participated in public speaking, research, and consulting roles. Currently, she teaches at Sacred Heart University and Housatonic Community College. She is listed in Marquis’ Who’s Who in America and Who’s Who in the World. Personal interests include travels and social organizations with her husband, Geno Piacentini, as well as quilting, gardening, and visiting nearby seashores.